In early September 2014 I needed more space for backups and media files, plus the ability to download things, stream with Plex on my local network and manage my WiFi APs with Ubiquity UniFi Controller web interface. All of this got me into the idea of getting or making a NAS. Fortunately I found out that some folks over at XPenology got Synology DSM up and running on a custom hardware machine using a custom bootloader, so I started getting my compatible hardware planned and ordered. Everything is running smoothly and perfectly for 3 years now, everything has been always on, with an activity on the hardware and the disks of over 25.000 hours of total uptime, so even if this post was long overdue (sorry), we can say it was, and still is, a great setup! If someone is interested or you are planning to make your own, I can put together another updated list with some new components since some hardware has changed during this time obviously, just let me know! Or I recommend to go buy a Synology NAS if you don’t have too many particular needs. 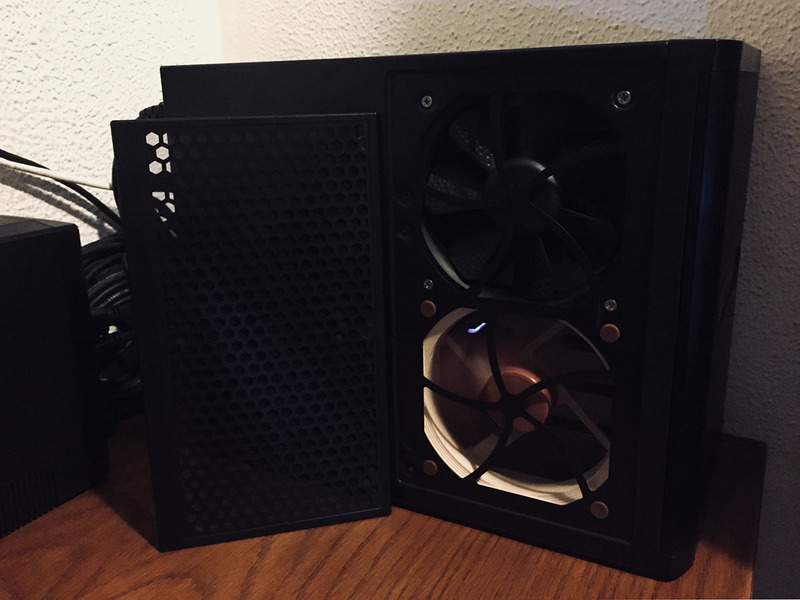 Case: SilverStone DS380 Black – Awesome small form factor case that supports 12 total, 8 hot-swappable, drives and with magnetic dust fan filters. 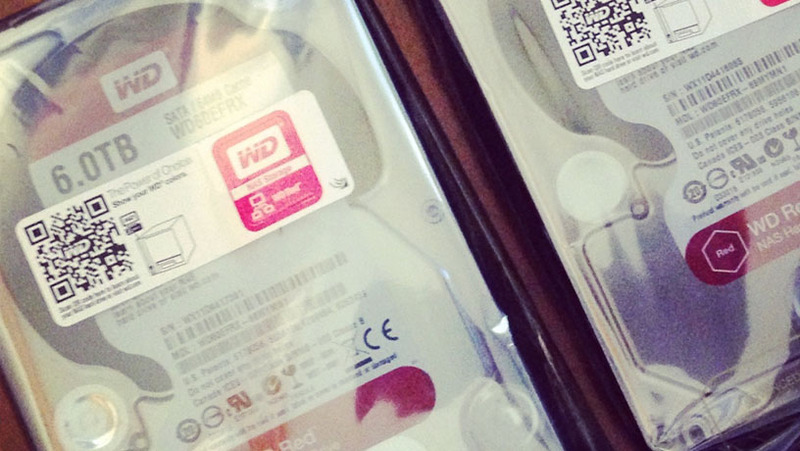 HDDs: Western Digital WD Red – Two 3.5″ 6TB drives in SHR-1 for one drive redundancy data protection. PSU: Be Quiet! SFX Power 2 300W – A compact, reliable and silent PSU to keep everything up and running with a 80 Plus Bronze level efficiency. USB: SanDisk Cruzer Fit – Micro-sized usb drive to run the XPenology bootloader for a DIY Synology DSM experience. UPS: APC Pro 550 330W – Little powerful UPS to protect from power surges and outages, with USB connection for auto shutdown if running low on battery. WiFi AP: Ubiquiti UAP AC PRO – Awesome and affordable enterprise level solution to fix WiFi probles you will have with standard consumer grade access points. I also recommend the new awesome AmpliFi products for a more simple setup. After 3 years of 24/7 spinning the 120mm Silverstone fan gave up and started making so much noise I had to replace it. 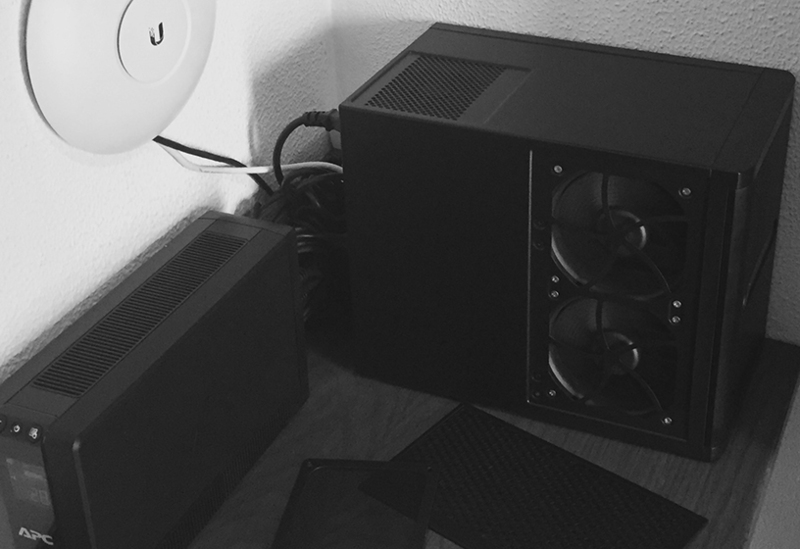 For the hard drives hot swap bays this case have two fans, but with just two disk installed on the bottom bays I went with just one Noctua for the job, disconnecting the other. With a Noctua NF-S12A ULN now the NAS is as silent as never before, while the drives are perfectly cool with direct airflow, you can’t go wrong with a Noctua! With years of activity I had to replace my #2 WD Red because it started giving errors, it was not a problem since Western Digital warranty replacement program really works great! At the same time I expanded the storage with an additional 6TB WD Red, making it the #3, for a total of ~12TB of space with one disk redundancy, at least until I get another 6TB drive and pass from SHR raid to SHR-2 for peace of mind.